When your Craftsman garage door and opener are installed, it feels good when you press the button and the door opens and closes as it should. To get to that point, you'll need to make sure the indoor opener and the remote opener are properly programmed. When the garage door opener has been installed and working for a while and suddenly the door won't open, it can be frustrating. Most garage door openers will work manually if the automatic function stops working, but checking the components of the door will usually reveal the problem. You'll need the garage door closed to program the Craftsman keypad. For the garage door opener transmitter, press and release the smart button on the garage door opener motor unit. The indicator light will glow for 30 seconds. Learn buttons are located on the motor head near the terminal strip for wire connections. Within 30 seconds, press and hold the button on the handheld remote. Then, release the button when the motor unit blinks. It has learned the code. If light bulbs aren't installed, you'll hear two clicks. For the wireless keypad, have your four-digit personal identification number ready before you start. When you have your PIN, press and release the smart button on the garage door opener's motor unit. The indicator light will glow for 30 seconds. Within 30 seconds, enter the PIN on the keypad. Press and hold the enter button. Release the button when the garage door opener motor lights blink. The first thing to do is check your door regularly to make sure it works. With the door closed, pull the emergency release cord and lift the door to see if it opens and closes smoothly. 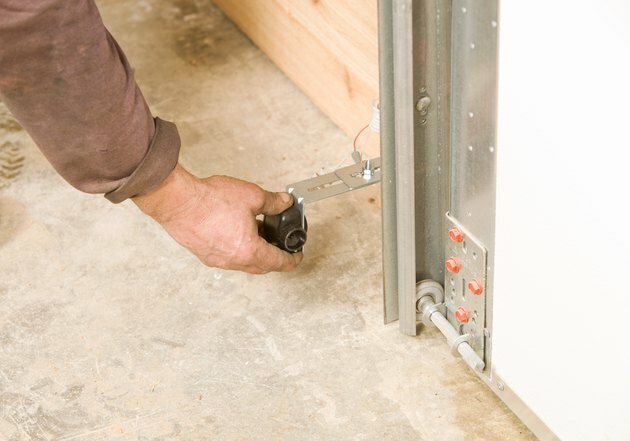 Even if the automatic opener fails, you should be able to manually lift your garage door. If it doesn't open or sounds rough, the problem is probably caused by your tracks, rollers or springs, not your opener. If the remote works but not the wall switch, you should check the wall switch and the switch wires. Unscrew the switch from the wall and touch the two wires together. They're low voltage and won't shock you. If the opener runs, the switch is bad. If you have a newer switch, buy the one designed for your model, which is around $15. If you have an older one, a doorbell button might work. If the opener doesn't work when you touch the wires, it might be the wires that are bad. Remove the old wires and install 18 to 22 gauge wire, and the switch should work again. If the wall switch works but the remote doesn't, check the batteries. If replacing the batteries still doesn't work, you may need a new remote. You should be able to find a new one online, but if your model is older, you may need a universal remote or you can install a new receiver. If the door won't open or close, you may need to reprogram the opener. If the door sticks when opening, the metal rollers and hinges need lubricating. Also, check the tracks. If the remote and wall switch don't work, check your circuits to make sure one isn't accidentally turned off. If the door goes up but only goes back down when you hold the wall switch, the safety sensors may not work properly. The light on each sensor should be lit. Sensors do go bad. You'll have to replace this. Also, check the chain tension. Make sure it's tightened according to the directions in your owner's manual. Overtightening will cause wear and tear on the shaft and gears. Too little tension could cause the chain to come off the rail. If you have power but nothing happens when you press the remote and the wall switch, your circuit board may be bad. To replace this, you can find the part number on the board. Then, remove the light bulb, disconnect the switch and safety sensor wires, remove the screws, unplug the board and install your new circuit board according to the manufacturer's directions. Make sure it's protected with a surge protector. You should regularly check your garage door opener as often as your manual recommends to make sure everything stays in good working order. Inspect mounting brackets, cables, fasteners, tracks and supports, looking for loose, bent or worn parts. Tighten, adjust or replace as needed. Check the cord connection between the opener and the electrical outlet to make sure it's secure and not frayed. Every couple of months, test the auto-reverse system to make sure it opens in case it comes into contact with anything while closing. Set an object in front of the electronic eyes, in the threshold and in the path of the electronic eyes. The door should reverse in each situation. Make sure your chain, screw and rollers are lubricated with a spray lithium lubricant. And, check your manual release system and make sure you know how it works.